UI-Olympus Bioimaging Center Scientific Awards 2015 : Call for Proposal! UI-Olympus Bioimaging Center (UOBC) in collaboration with Directorate Research and Community Services UI proudly presents UOBC Scientific Award 2015. UOBC Scientific Awards 2015 is a program that funded by UI-Olympus Bioimaging Center to support and encourage the development of research in any scientific area that involving Bioimaging method. The Awardee would be granted for an official certificate and instant fund/grant to support their research/publication. 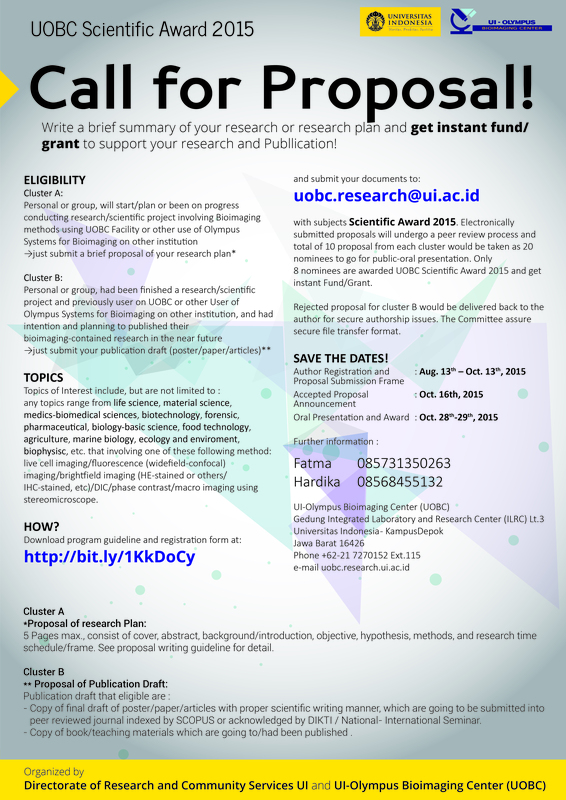 For registration, send an email with subject “UOBC Scientific Awards 2015 Registration” and attached your proposal, submit to : uobc.research@ui.ac.id , before October 10th, 2015. Accepted proposal announced at October 16th, 2015. Hakcipta 2017 © ::UNIVERSITAS PASUNDAN ::.